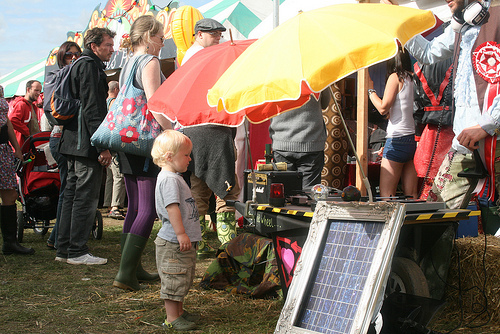 Shambala Festival part three: Lovely Day – Creative Dynamo Ecotainment! Sunday morning was overcast but enthused by yesterdays breakfast show I went for another outing. These morning gigs work really well as there is nothing planned on the main stages until midday so no fear of me being drowned out. There is also a nice mix of people some who have been up all night, others buying breakfast and of course families whose kids are already wide awake and looking for some entertainment. What followed was one of the most memorable gigs ever – in effect a gym-like spinning class. Encouraging stationary cyclists to keep pedalling whilst promoting renewable energy and recycling (of old mobile phones) to cheesy wheelbarrow disco music. What’s more, radio Shambala were there to record the whole event interviewing Electric Pedals, the cyclists and passers by at www.shambalaradio.org.uk. Looking back this gig was possibly the highlight of the festival for Earwig the ‘barra’ but before I explain why I must explain a bit more about Electric Pedals (EP). generating interest at the phone charging disco! EP have about 10 pedal power generators attached to stationary bicycles (each generator costs £450). There are no batteries or solar panels involved the only power they have is generated in ‘real-time’ by the cyclists. If there are not enough cyclists then there is not enough power for the phone charging or motivational music. On this occasion although the bikes were busy the power required by the phones meant that there was not enough energy for the music. 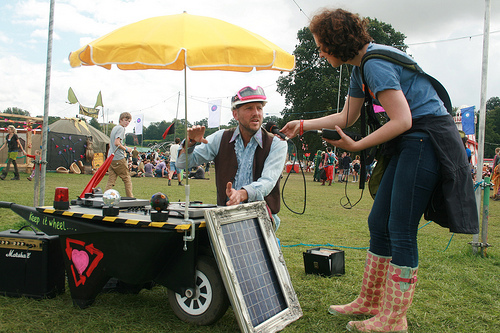 Not only had Shambala triumphed by delivering something un-planned and impromptu for the radio (as expected) but Earwigs speaker and renewable rig had managed to hold it’s own surrounded by much larger and more expensive, louder systems! We also managed to get the recycling and renewable message across with maximum audience participation in a fun and original way, which is the main purpose of Tip of the Pops. If the EP gig and radio Shambala interview was a technical and educational achievement what happened next was my own personal highlight of the festival. Afterwards, I left the main hussle and bustle of the festival to return to the family field and baby bath house. Playing nursery rhymes and relaxing music to parents and children as the sun went down was a real treat and extreme contrast to the gig I had only just done! To make this moment even more magical a dizzy bee landed on my spinning disco ball and stayed for 10 minutes fascinating children and parents alike. As we all sat around Earwig mesmerised by the sights and sounds of Shambala a film crew appeared and recorded some of the action. I played an hour and half set ending with the Floral Dance by the Brighouse and Rastrick Brass Band which was most appropriate! Lasts years Shambala experience, my first, could only be summed up as sublime – this year words still escape me! Needless to say I left enthused, energised and eager to return next year for more glittery magic. ← Shambala Festival part two: Keeping it wheel… Piggy-wig style!